If you watch the opening credits of “Hawaii Five-O” episodes, the first “guest star” you’ll usually see listed is Taylor Wily. He plays the obese shrimp truck owner, comic relief of the show and usually only appears at the end for about 40 seconds. 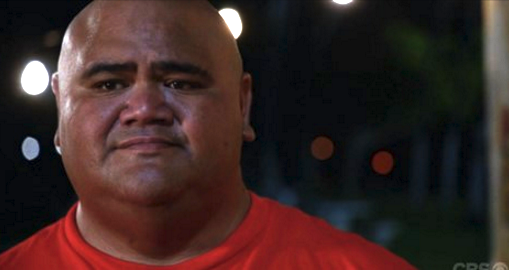 This past Friday, the Hawaiian was again shown as the first guest star of the week, but his role was by far the biggest he’s ever had in the show’s six seasons. The episode opened with a flashback from a dozen years ago when Kamekona (with mustache and goatee) and his henchman confront Remy, a drug dealer. Things begin to get hostile as they argue and his pals draw guns. Then the Honolulu Police Department, led by Chin Ho Kelly (Daniel Dae Kim), barges in and arrests them all. But as Chin Ho leads the thug to the squad car, he uncuffs him and thanks him, adding that if everything works out, he’ll be out of jail in two years. Turns out he was working undercover for them, wearing a wire. Wily surprised with a solid, grounded performance, helped in part by the fact that for once, his dialogue wasn’t accompanied by the usual “quirky music” that indicates to viewers that this guy (fat, pidgin English accented) is not to be taken seriously (an insulting and long problematic message to viewers). In present day, his childhood friend Levi Sosa, who just got out of jail after 12 years, returns to check in on him. Though Kamekona says he’s gone straight, Levi still wants him to do a few favors. Shortly after, Remy, the drug dealer, turns up dead on a beach and Levi is the prime suspect (he even admits to his old friend he suspects Remy was the one who betrayed him; uh oh!…). With Steve McGarrett and Danno Williams off to couples counseling on Maui (seriously), Chin Ho, now a part of Five-O — for once — gets to runs the show. He persuades Kamekona to go undercover again, wearing a wire in an attempt to get Levi to implicate himself in the murder. In another flashback from 1967, we see a younger Kamekona living with his family on the beach selling trinkets to tourists to get by. That’s when he meets Levi and falls in with the wrong crowd. (The kid was badly cast as he looks white and fair-skinned; guess the adult Kamekona got his darker complexion by staying in the sun more as time went on?… Also, they could’ve done something to make Daniel Dae Kim look different, maybe giving him longer hair in the 2003 flashback because he looked exactly the same as he does in present day). We also saw how Kamekona first met Chin Ho when the police raided his place. Kamekona’s brother Kanoa refused to tell Chin Ho that Levi had put him up to his crimes, so in order to keep his brother from going to jail for a long time, Kamekona was persuaded to wear a wire. (SPOILER ALERT if you don’t want to know how this episode ends.) In present day, Levi gets Kamekona to drive to a hotel room, where he admits he knows Kamekona’s the one who turned against him and asks Kanoa to shoot his long-estranged brother. Kamekona tells Kanoa he should realize he’s been doing Levi’s dirty work ever since Levi got him to sell drugs as a young kid. It doesn’t work, so, accepting his fate (Five-O lost his tail and are trying desperately to find him), Kamekona tells Kanoa, “I still love you, baby brother.” Which leads Kanoa to have a change of heart, lowering his gun. Levi decides to do it himself, and Kanoa shoots him dead as Five-O finally arrives. We also see an interesting scene where Chin Ho visits Kamekona in prison and tells him after he gets out in two years, he could make the most of his second chance, and leaves him a book about how to “Think and Grow Rich!” Kamekona tells him selling shave ice makes the most sense as water is free and the profit margin’s the highest. Chin Ho smiles and says he’ll be Kamekona’s first customer if he starts a shave ice company. In other words, Kamekona got on the road to legitimacy because of Chin Ho. Cool. Years ago when I suggested the show make better use of Taylor Wily, a former CBS executive implied that the actor had a limited range. He was wrong; Wily just wasn’t given material worthy of his talent. I hope to see him get meaty parts like this in the future. A continuing subplot is that Adam (the excellent Ian Anthony Dale), Kono’s (Grace Park) husband, is in jail for 18 months for shooting three thugs who took him into the forest to kill him. It’s a ridiculous plot since he was only defending himself against certain death. True, Adam had a criminal past, but he’d gone straight, even freeing his Yakuza dad’s company of anything remotely linked to criminal activity, and Five-O certainly could’ve put in a good word for him to avoid jail time (his limited use could be due to the actor’s role in another cable show). 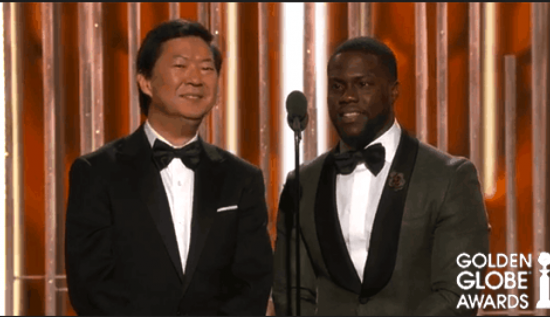 Ken Jeong and Kevin Hart at the Golden Globes. There Is a God Department: As the names for Best Actress in a Comedy were read at Sunday’s Golden Globe Awards, I knew Rachel Bloom, star and co-creator of the CW’s “Crazy Ex-Girlfriend,” had no chance of winning. She was up against Lily Tomlin, Julia Louis-Dreyfuss (who always wins at the Emmys), and Gina Rodriguez, star of “Jane the Virgin,” which follows her on Monday nights, and her show averages barely a million viewers each week. And then her name was called. Woah! It was the highlight of the night for me. Bloom, clearly shocked and in tears, pointed out that her pilot was rejected by the network that commissioned it (Showtime) and although they tried shopping it to other networks, they got six rejections in one day! Her recognition is so well-deserved. As I said in my column, it takes a special person/actress to be able to pull off playing a stalker and make her sympathetic and for the audience to want what she wants. And she purposely cast an Asian American male (Vincent Rodriguez III) to be her love interest. Be sure to watch the show when it returns to the CW on Jan. 25! To watch her speech, go to https://www.youtube.com/watch?v=2tQ-2b11rKQ. The list of nominations starts around the 1:04 mark. Another highlight was seeing Aziz Ansari when his name was called as one of the nominees for Best Actor in a Comedy for “Master of None.” His head was buried in a book, “Losing to Jeffrey Tambor with Dignity” (actually, Tambor lost). Pretty damn funny. 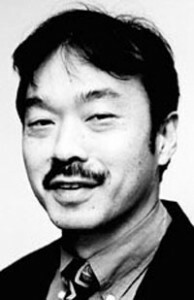 The only Asian American presenter was Ken Jeong, who appeared with Kevin Hart, his co-star in the new film “Ride Along 2.” Host Ricky Gervais introduced them as “adorable little performers” Angelina Jolie and Brad Pitt would love to adopt (because they’ve adopted Asian and black children in the past and are short). Some probably cringed at yet another attempt to infantilize an Asian male, just as Matthew Moy gets subjected to on a weekly basis on the horrible “2 Broke Girls.” But the two comedians posed with Jeong resting his elbow on Hart’s head, so they must’ve been OK with the joke. Leftovers Department: I forgot to mention one notable person in my annual “Wise Guy Awards” last time out. You Call Yourself a Journalist? Award to Lisa Ling, who admitted to taking the dangerous drug ecstasy because a fellow raver told her the euphoric drug wasn’t addicting. Years ago at an Asian American Journalists Association convention in L.A., Ling told audiences about her recently released sister and how great it was that she bonded with her North Korean jailers. Duh, have you never heard of “Stockholm Syndrome”? !